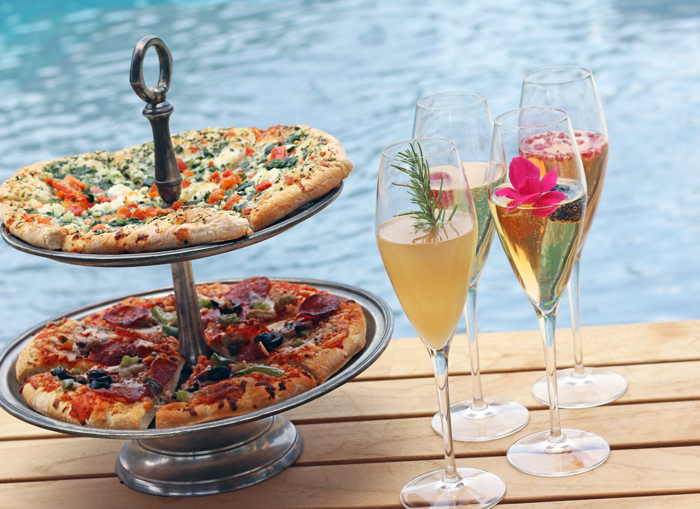 Pizza and Sparkling Wine (Champagne, Cava, Prosecco…) are two of my favorite things. Naturally when I think of the perfect girls’ night in, I want to pair them up. Here is the easiest way to entertain this Summer. 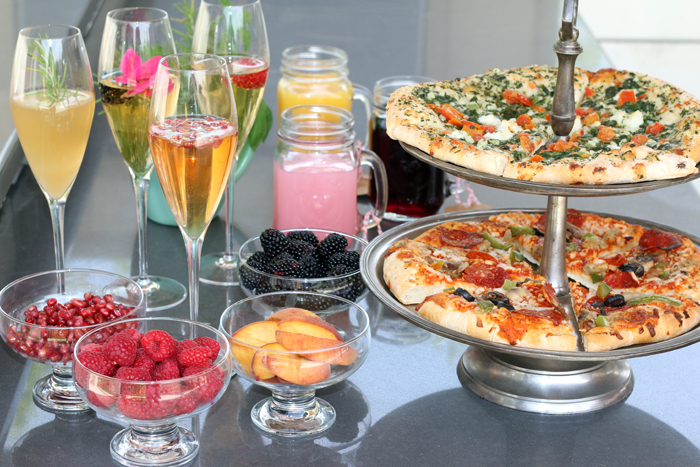 Set up a Sparkling Wine Bar with fresh fruit and herbs, juices and liquors, and bake a few California Pizza Kitchen oven-ready pizzas like the new Hand-Tossed California Style White or The Works, both made with a Hand-Tossed Style crust that’s crispy on the outside and fluffy on the inside. Your ladies will feel spoiled by tasty treats even though you spent more time working on your outfit than working in the kitchen. It’s Summer, no one has time for any of that. 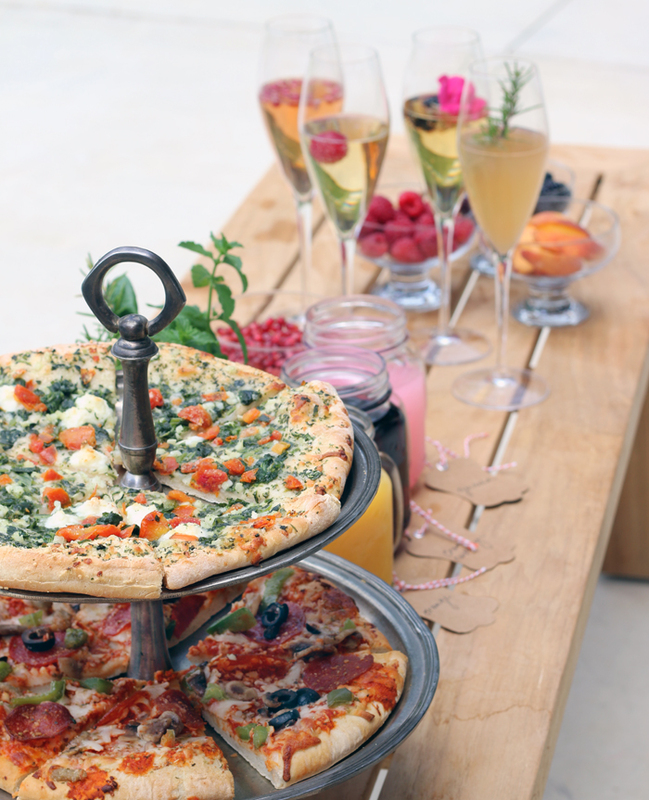 The best part is that between the delicious pizza options and DIY Champagne bar, everyone will find something they love. 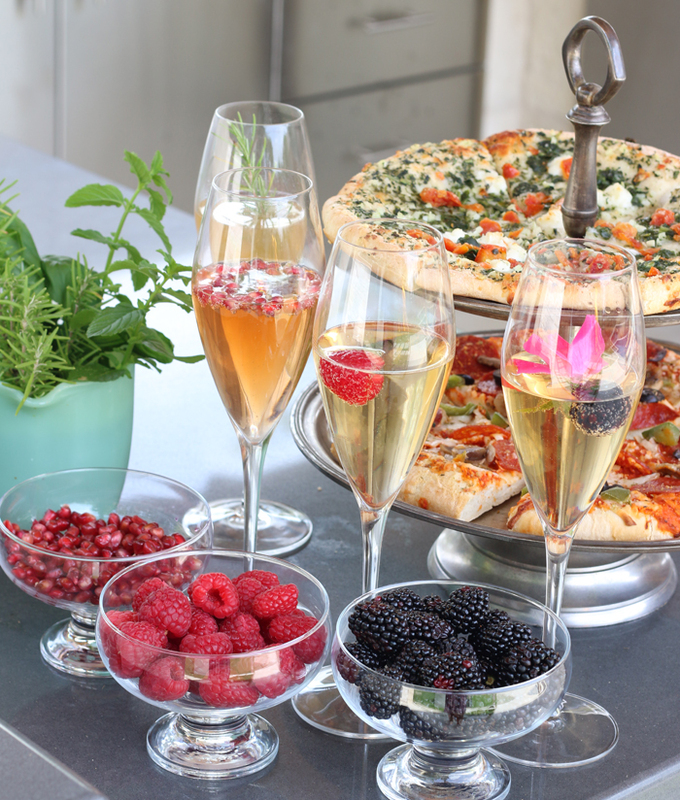 Read on for our favorite tips and ingredients for the perfect Champagne Bar and 4 simple and delish champagne cocktails, all inspired by the combinations of premium ingredients in CPK’s oven-ready pizzas, like vine ripened tomatoes and gouda cheese. Now I’m hungry. 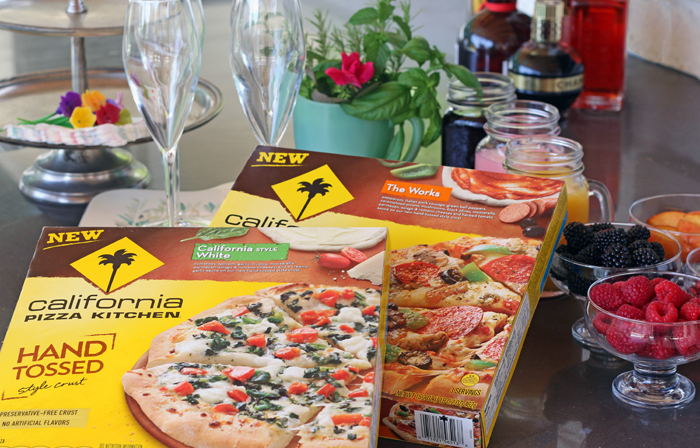 Grocery Store: One California Pizza Kitchen oven-ready pizza per 3 guests. 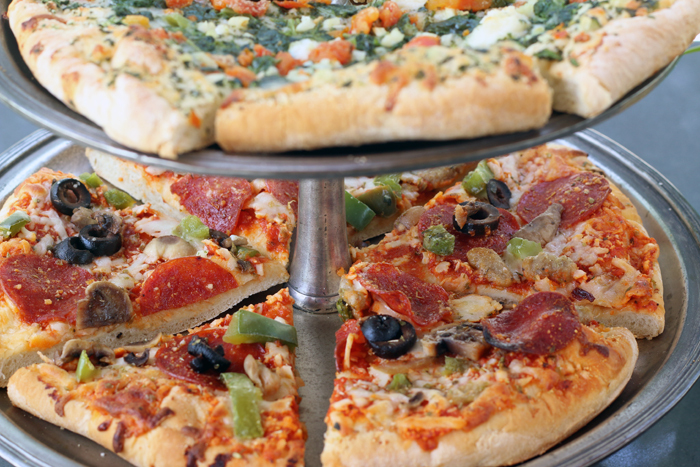 Try the all-new options like Hand-Tossed California Style White, BBQ Recipe Chicken with Bacon, and The Works, and Gluten-Free Margherita Pizza. Also pick up raspberries, blackberries, a peach, pomegranate seeds, orange juice, guava juice, and cranberry juice (or whatever you have in the fridge) and any herbs from your summer garden like rosemary, mint, basil, and edible flowers like untreated roses. 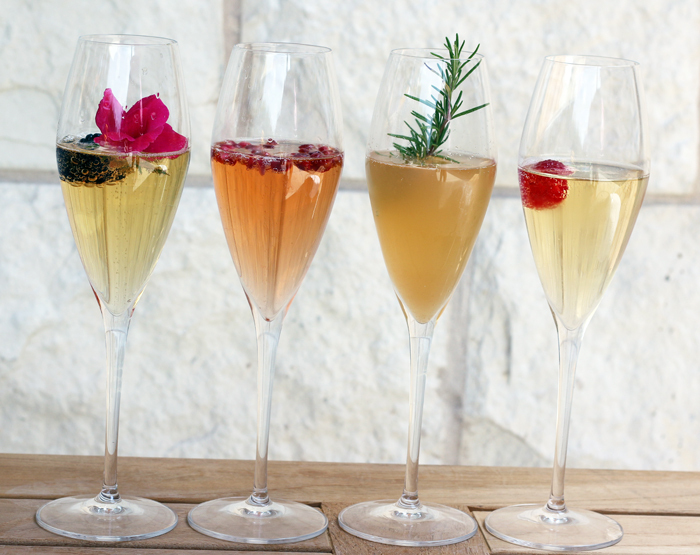 Liquor Store: Pomegranate Vodka, Elderberry Liquor, Grapefruit shrub (or Ruby Red Vodka), Sparkling Wine and Sparkling Water. 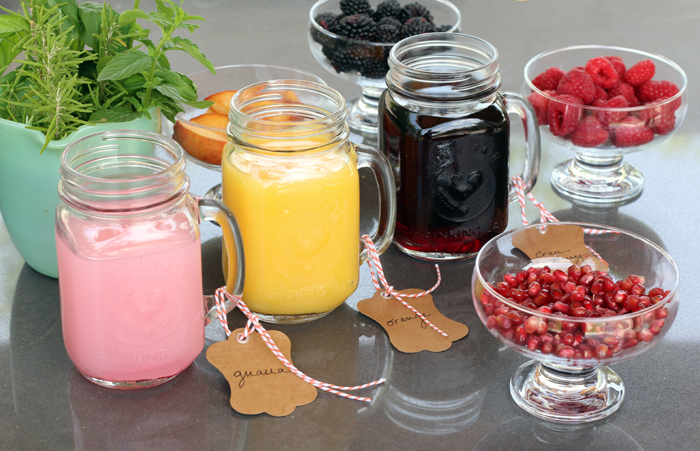 Bring out any other elixers you have on hand, you might learn some new recipes from a mixologist in the group. 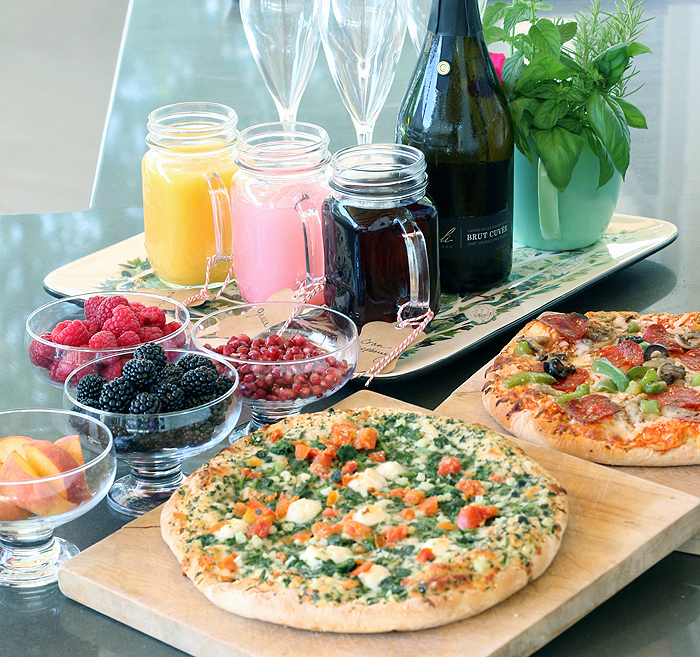 Pantry: Cutting boards, pizza cutter, serving tray, small plates and bowls, champagne glasses, wine charms, napkins, and juice jars. 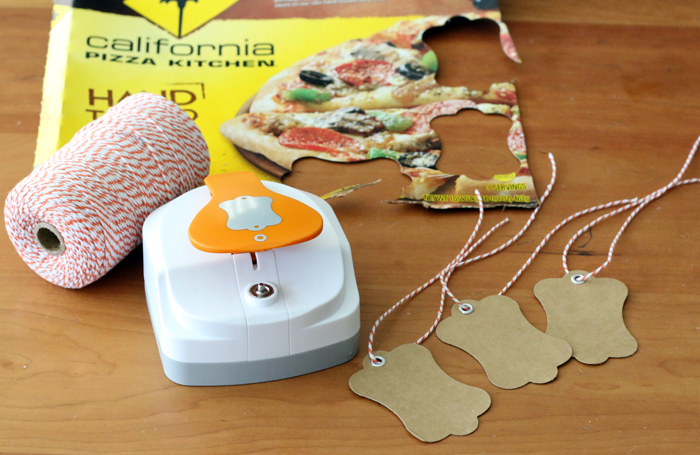 Make some cute tags for your juices and even to use as wine charms with your pizza box and some baker’s twine. Wait until the last minute to pop these tasty beauties in the oven. They look homemade! Introduce everyone to your suggested cocktails by either providing a menu or playing bartender. The beauty on the left is a glass of sparkling wine with a splash of elderberry liquor, topped with a blackberry and a small garden rose. 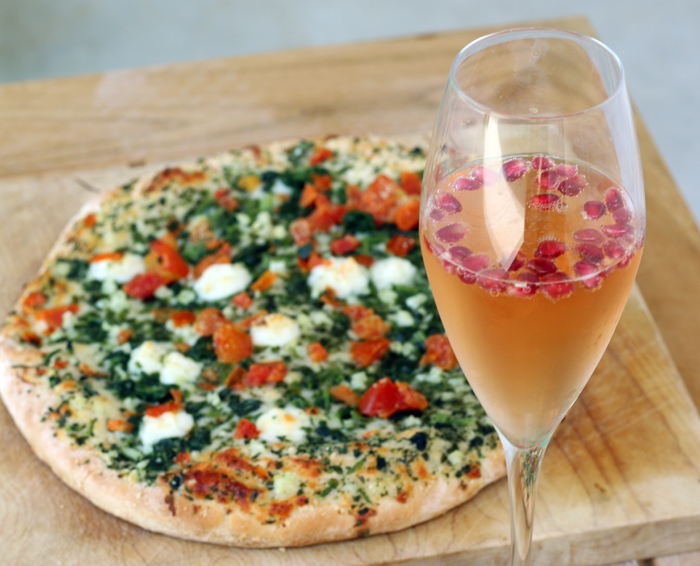 It pairs wonderfully with CPK’s oven-ready Margherita pizza. It’s called The Amanda, named for my sister who originally introduced me to this combo on a trip to NYC. Feel free to name your cocktails after your own loved ones, ha. Non-alcoholic version: Sparkling water with guava puree. Next we have The Rebecca. My sister-in-law and I often indulge in this festive elixer over the holidays. 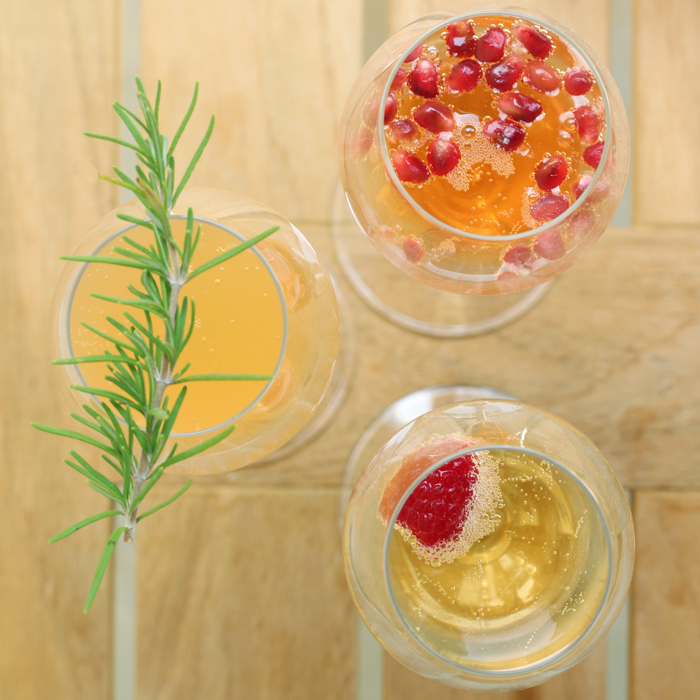 It’s a glass of sparkling wine served with pomegranate seeds and a splash of Pomegranate vodka. 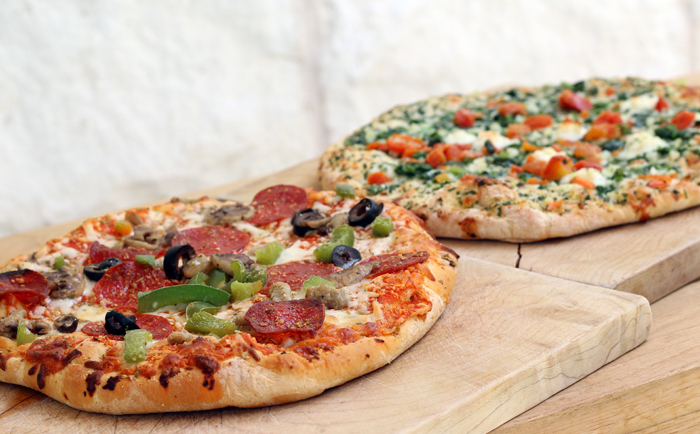 This recipe pairs great with CPK’s Hand-Tossed California Style White Pizza. Non-alcoholic version: Sparkling water with cranberry juice and pom seeds. 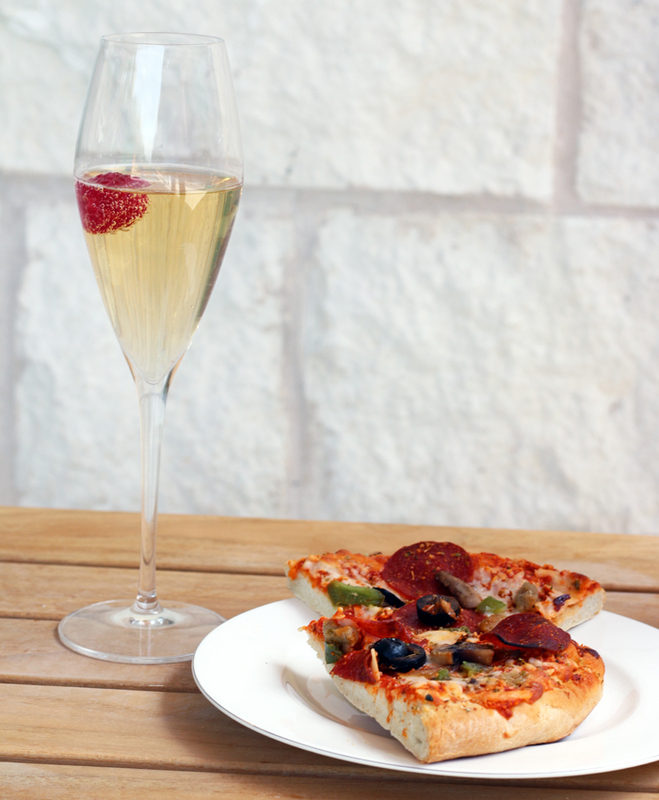 And lastly as the perfect compliment to CPK’s Hand-Tossed The Works pizza, a crisp glass of your favorite bubbly all on it’s own. Maybe just one raspberry to make it fancy. We’ll call this one The Jaime because we have been known to share our hopes and heartbreaks over a glass of our favorite champagne. The pizza party has never been so elegant. Pick a date, invite your besties, and make a quick run to the store. 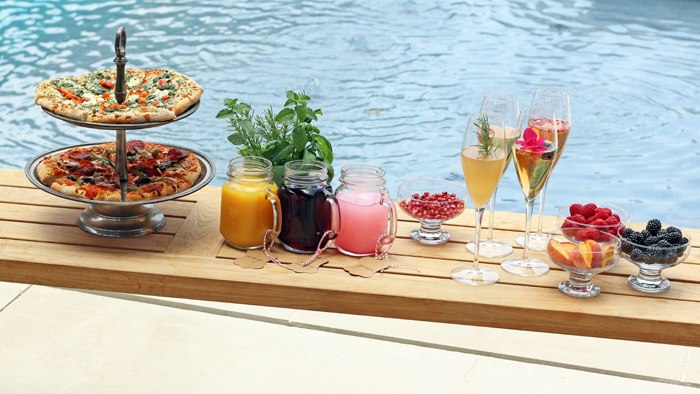 It’s that easy to entertain in a simple, beautiful and delicious way this Summer.